Everyone knows the line “Merry Christmas, Ya filthy animal” from the movie Home Alone, you know the one where a boy’s parents forget him at home during Christmas vacation and he has to protect his house from a pair of burglars. This sweater will evoke the same humorous reaction as watching the movie. Prepare for a lot of laughs. Perhaps, the greatest sweater I’ve seen so far this holiday season- a nod to Drake’s “Hotline Bling” music video. By now, everyone has seen the video and can’t help but chuckle at some of his interesting dance moves. This sweater features some of his moves, complete with some snowflakes to add more of a holiday feel. Prepare to be the highlight of the party with this fun holiday Drake sweater. Anyone who has seen the movie Mean Girls will appreciate this sweater. Everyone remembers the iconic line, “FOUR for you, Glenn Coco! You go, Glenn Coco”. This pink sweater even has four candy canes, you know so it’s accurate with the line in the movie. Prepare for people yelling the movie line at you from across the room the entire night. 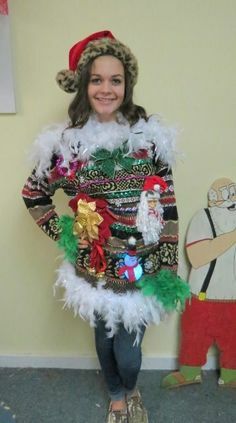 I think the goal of any DIY Christmas sweater is to make it as loud and obnoxious as you possibly can. I’m talking ornaments, glitter, garland, bows- anything that really screams Christmas. Prepare for a lot of compliments on your very merry decked out holiday sweater. Of course there are many more out there, just find one that suits your style. This is your chance to go all out and take that first place win on the best Ugly Christmas Sweater.